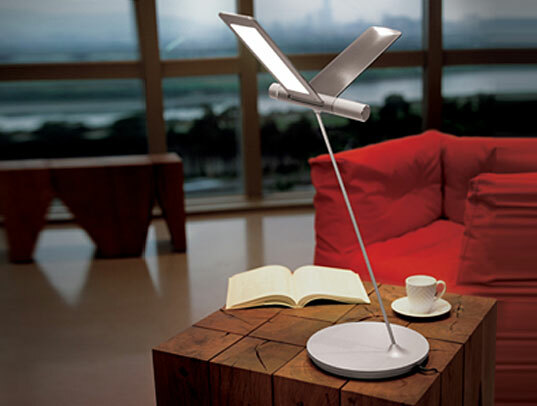 The Seagull Light is a LED table lamp that takes the form of a flying seagull and functions similarly too. With two knobs on the main body – the front one for adjusting brightness and the back for adjusting lighting angles – the “wings” change positions in tandem with any lighting adjustments, in turn imitating a seagull flapping its wings as it soars into the sky. Utilizing efficient LEDs, the bulbs consume much less energy than traditional lighting sources, yet provide the perfect amount of illumination whether for ambient lighting or more intense reading light. 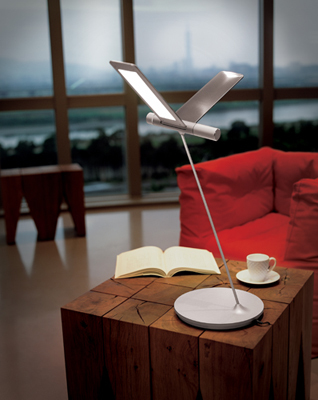 The Seagull Light is a LED table lamp that takes the form of a flying seagull and functions similarly too. With two knobs on the main body - the front one for adjusting brightness and the back for adjusting lighting angles - the “wings” change positions in tandem with any lighting adjustments, in turn imitating a seagull flapping its wings as it soars into the sky. Utilizing efficient LEDs, the bulbs consume much less energy than traditional lighting sources, yet provide the perfect amount of illumination whether for ambient lighting or more intense reading light.